In 1762, Blue Hill’s two founders, John Roundy and Joseph Wood, sailed up the bay to disembark on Mill Island, next to the reversing falls. The French and Indian War was coming to a close. Eastward as well as westward out-migration was spurred by burgeoning population growth in southern New England. A recent rash of forest fires in lower New Hampshire stimulated eastward exploration for timber. The frontier dangers of harsh winter climate and wild animals remained. After building log cabins, Roundy and Wood returned to homes in Massachusetts to spend the first winter but returned with their families the following year to settle permanently in Blue Hill. Soon, other families came and the conditions of the six-mile-square land grant for township were met: sixty homes exceeding minimum size, each with five acres of cleared land, a Protestant church and minister, land for a local school and another share of land for the use of Harvard College in Cambridge. Names of early settlers included Darling, Parker, Osgood, Peters, Holt, Candage, Day, Hinckley, Horton, Carleton, Friend, Dodge, and Clough. The original name of the area was Plantation No. 5. 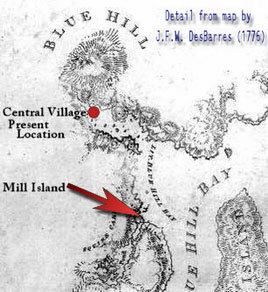 By 1778, the township became Bluehill, later spelled Blue Hill. While the original settlement was at Blue Hill Falls, the center of the village eventually formed at the head of the inner harbor, its present location. 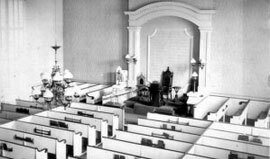 The First Congregational Church was formed in 1772. It was the first to be organized east of Penobscot Bay. The new meeting house was situated on the north side of Main Street at the top of Tenney Hill. 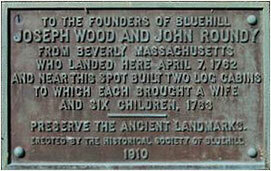 John Peters presented a Paul Revere bell and Reuben Dodge provided the wherewithal to build a tower to accommodate it. The entire structure burned to the ground in 1842. The present Congregational Church, half way down the hill on the south side of Main Street, was built by Thomas Lord in 1843. 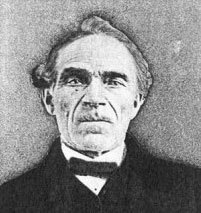 In 1805, Reverend Daniel Merrill organized the Baptist Church. 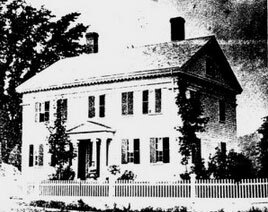 Its building, begun in 1817 and remodeled in 1856 by Thomas Lord, still stands on Pleasant Street. 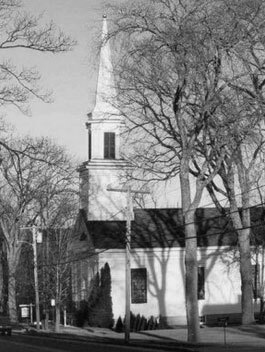 In 1794, Reverend Jonathan Fisher, a graduate of Harvard College and the town’s first settled minister, began his forty-three year pastorate at the First Congregational Church. Both Lord and Fisher are regarded now as local figures of wider historical significance. Thomas Lord, a builder of many churches and houses in the area, typifies the American folk tradition in architecture. Reverend Fisher, an energetic multitasker, produced engravings of artistic merit, currently on exhibit at the Farnsworth Museum in Rockland. A village of elm tree shaded streets and Federal style clapboard houses grew up around the two churches. Mills at multiple sites on the shore sawed timber from neighboring hills. Immediately adjacent to nearly every sawmill, a boatyard appeared. During the first half of the nineteenth century more than 130 ocean-going sailing vessels were built in Blue Hill, Blue Hill Falls and East Blue Hill. Most were schooners and brigs for the coastal trade but some were full-rigged ships and barks that ventured farther on the world’s oceans. In this era, the town’s economy was supported by shipowners, shipbuilders and peripheral occupations such as fishing, farming, merchants, millers, craftsmen, and blacksmiths. Cabotage favored coastal trade but the Civil War closed markets and enabled Confederate raiders to seize and burn northern merchant vessels. Moreover, steam-powered vessels with steel hulls were turning up. The wooden shipbuilding boom in Blue Hill virtually ended by 1865. A local author, Mary Ellen Chase, described the post-Civil War economic slide of coastal towns like Blue Hill in her novels Mary Peters and Silas Crockett. But a vein of granite coursing along the northern shore of Blue Hill Harbor and extending out Wood Point and down the length of Long Island had been yielding premium building material for some time. Wharves were built to ship out huge blocks and columns as well as paving blocks to cities along the eastern seaboard and beyond. Blue Hill granite quarried by Darlings, Hinckleys, Chases, Slavens and Collinses were used to build churches and bridges in New York, public buildings in Washington and Pittsburgh, streets in New Orleans as well as many local edifices. In 1876, copper mines began to open along the shore and westward along the present Mines Road. Blue Hill Copper and the Douglass were among the earliest and the largest mines. Western engineers and workers flooded Blue Hill. Speculation went wild. A central boarding house was enlarged; it was named the “Copper and Gold Exchange.” The mining boom subsided almost as quickly as it started. By 1881, only six of thirty-nine companies continued to operate. As the nineteenth century closed, the steamships were no longer carrying out copper but they were bringing in “rusticators” or summer vacationers. For those that could afford it, families fled from the anticipated epidemics of tuberculosis and poliomyelitis in hot cities to the cool breezes of coastal Maine. In 1881, Captain Oscar Crockett opened a steamboat service from the railhead at Rockland to Blue Hill. A summer colony formed on Parker Point. The Blue Hill Inn flourished at the top of Tenney Hill. The season was enlivened by gala events, music recitals and sailing excursions… still summer happenings at Kneisel Hall and Kollegewidgwok Yacht Club. During the twentieth century, railroad connections, then the automobile, made Blue Hill more accessible. The summer stream of visitors continued unabated. As well, a growing segment of people from away became year-round summer folk as they retired or fled the strain of high energy careers in crime-ridden cities. The descendants of shipbuilders are now building imposing homes and servicing large yachts. Both natives and newcomers have contributed to the town’s first-rate library, hospital, schools and parks. The current, sustained real estate boom is fueled by what R.G.F. Candage, a Blue Hill bred nineteenth century clipper ship captain, called “the charm of its situation, its sparkling bay, its inlets, its shores, its landscapes of hill and dale and plain…” The challenge is to maintain the beauty and character of the town in the face of an increasing population. N.B Much of the text was derived from Clough, A.: Head of the Bay, recently reprinted and available for purchase from the Blue Hill Historical Society. For additional information on Blue Hill’s history and a digitial museum of over 150 images of early Blue Hill photographs and artifacts, visit Blue Hill’s history website hosted on the Maine Historical Society’s Maine Memory Network, at mainememory.net.